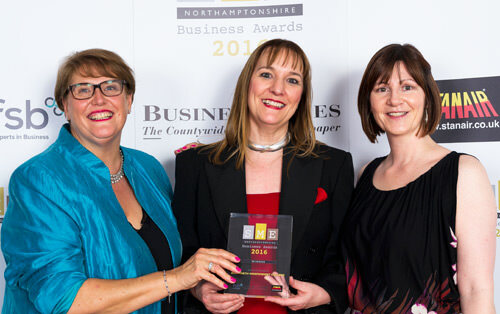 The SME Northamptonshire Business Awards 2016 took place in October. The awards are in recognition of all the small to medium enterprises in the County and the hard work, drive and excellent service that the best of its local businesses provide. 57 companies were shortlisted as finalists for 17 separate awards ranging from Business of the Year to Young Business Person of the Year. In our category for Service Excellence there were 8 companies as category finalists. In each category there was a runner up and a winner, obviously we were surprised and delighted when Bosworth’s name was called as the winner! Our host Vick Hope, a Cambridge Graduate and presenter on 4Music and ITV2, went onto say, “Bosworth were head and shoulders above their competitors in this category.” An extremely flattering statement, considering the successful businesses we were up against and one of which we are immensely proud. Whilst we normally celebrate our successes via student results and university destinations / competitive degree courses it was refreshing to also recognise we are a business that takes very seriously the customer service angle of what we do. “With 33 different nationalities in our student body of which a large majority board with us, the student experience has to be at the heart of what we do, not only do we expect that students in our care achieve their very best academically but that they also develop into confident and well-rounded individuals, enriched by their time in our cultural environment. This starts from the very first phone call or email with the Admissions Team right through to the pastoral/boarding care on offer, our Personal Tutor scheme and the vast array of extracurricular activities students can join. We always aim to go above and beyond to offer a personal tailored service to each individual in our care.